엔토영어는 발음, 경력, 티칭실력 등 베테랑 강사님만 함께 합니다. 그 만큼 자신있게 강사님의 프로필, 동영상과 샘플수업, 학생평가 및 수강후기를 공유합니다. 꼼꼼하게 비교해 보시고 수강신청 할 때 직접 나만의 강사님을 선택해 주세요. 엔토영어는 베테랑 강사님만 함께 합니다. 강사님의 프로필, 동영상과 샘플수업, 학생평가 및 수강후기를 공유합니다. 엔토 매니저님! Dainese 선생님은 어떤 분이신가요? Hi! My name is Dainese Santos, and I'm currently a graduate student at New York University, where I'm studying to get my Master's degree in Publishing. 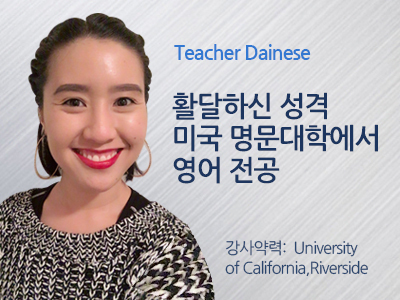 Previously, I studied at the University of California, Riverside, where I graduated with a Bachelor's of Arts in English and Literature, with highest honors. 안녕하세요. 제이름은 Dainese입니다. 저는 현재 New York University에서 방송학 석사를 전공하고 있습니다. 저는 University of California, Riverside에서 영문학 학사를 취득하며 수석으로 졸업하였습니다. I have previous experience tutoring one on one with middle school, high school, and university students, and have a background in editing for business professionals and helping them improve their writing and grammar. 저는 일대일로 중고등학생, 대학생에게 개인과외를 한 경험이 있고, 비지니스 실무 영어교정의 경험도 갖고 있습니다. I'm cheerful and friendly, and I hope to foster a learning environment where you can feel at ease. I know the challenges that come with learning another a language, but with patience, practice, and positivity, we can achieve your language goals together! 저는 활기차고 친절하며, 편안한 환경에서 수업을 듣도록 해드립니다. 새로운 언어를 배운다는건 아주 어려운일이이라는것을알지만, 인내하며, 연습하며, 긍정적인 태도를 가지면 언어를 배우는 목표를 달성할 수 있을것입니다.